This is what happens to you when you're 4 feet 8 inches and you have a completely normal sized baby. Most people, including myself and my husband, thought there was no way that my belly could possibly grow anymore, but it did! The photo on the right was taken at 37.5 weeks and Nick didn't come until 39.5 weeks. So my alien belly was even bigger than these photos. I am kind of glad there is not documentation of that. I was in labor for 20 hours before my doctor ended up doing a c-section. It was kind of a "duh!" moment for me, as I had a sneaking suspicion my entire pregnancy that I would be having a c-section. And when Nicholas came out at 7 lbs 13 oz, everyone in the room (and the world) was shocked! 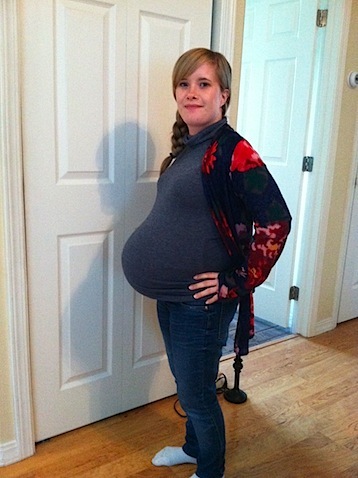 You know that whole fishbowl theory, when they say that a baby will only grow as big as there mom is? Wrong. I am the proof. 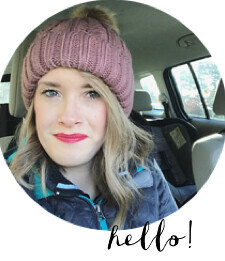 i have a feeling i'm going to love this blog, in addition to your other one! hahaha! mackenzie! first, i am so happy that you have a blog. second, OH MY GOSH!! 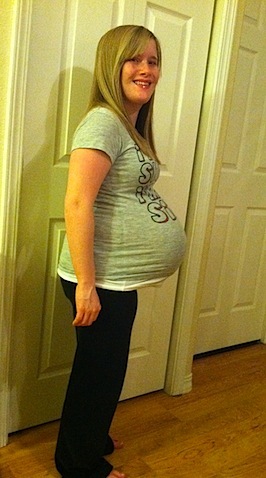 you are the most adorable pregnant lady (and largest belly in proportion) that i have ever seen! aww i love it. So happy you have a healthy baby boy, i hope i get to meet him. Jami had a great idea, that our DTS people should rent a cottage for a week and all hang out, wouldn't that be wonderful?